If you only want to exercise for 10 minutes, is it enough? Yes! If you have a set of dumb bells and only 10 minutes, you can still do a reasonable work out. Just get on with it, and don’t rest too long between sets, move from one exercise to the next. Your heart rate will go up, your muscles and joints will benefit, and you’ll feel good. Do that for 5 or 6 days a week and you’ll make some progress. And some days you’ll over run, and you’ll find yourself still working out at the half an hour mark. Dead lift: Holding the dumb bells by your side, run them down the front of your legs. Maintain a neutral spine, let your knees bend, and come up again. Curl and press: Holding the dumb bells, curl your arms up, using your bicep muscles, and then reach for the sky. Lower back down. Lunge: Holding the weights by your side, take a big step forward bending the front knee. Step back and repeat with the other leg. Press up: Get down on the floor, keep your body straight. Bend those arms and press back up. Too hard? Do it from a chair or the kitchen bench top. Do each exercise 10 times, take a 30 second break between sets if you need to, or move straight on to the next exercise. Aim to go through everything at least twice. If you’ve still got a minute do a quick yoga pose. The cobra and the downward dog are my favourites. 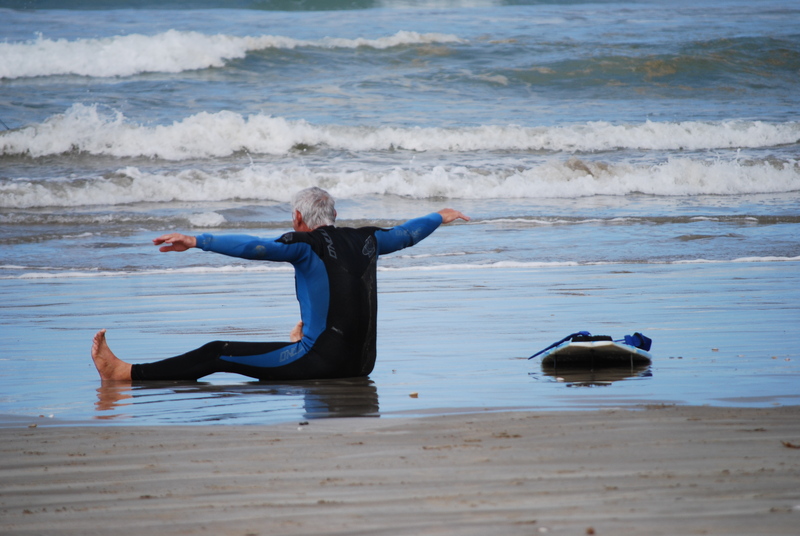 Or you could just pull on your wet suit and go splash around in the surf….